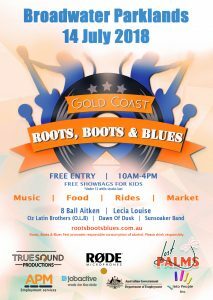 Roots, Boots & Blues is a FREE exciting new festival happening at the Broadwater Parklands, Southport, Gold Coast on 14 July. Acts include 8 Ball Aitken, Lecia Louise, Oz Latin Brothers, Sunsoakers, Mozaic and other blues/roots acts. It is a free family event including six hours of international and local musical artists, dance, international foods, rides, games and song contest, there will be free show bags for kids aged 12 and under for a limited time. We also have a Blues song contest for anyone willing to participate, for more info please visit the website.